Whatever one’s view of religion or relics, the exhibition Treasures of Heaven: saints, relics and devotion in medieval Europe at the British Museum was a feast of extraordinary art and craft from the middle ages, from Rome via 10th century Byzantium to 15th century France. It included stunning Limoges enamel reliquary boxes and gold and silver reliquary statues. Looking at the objects was one thing, watching the visitors another. A man I thought was cleaning sticky marks off the glass of one case was, I realised, making the sign of the cross repeatedly – possibly with his mobile ‘phone in his hand - was he filming his actions? A woman came up to the same case and held her hand flat on the glass, channelling the relic. Near another case, I was aware that standing behind me were a man saying his rosary and a woman whispering prayers. Alas, no one else can go and watch the visitors – I visited on the last afternoon of the exhibition and the relics have been returned to their respective museums and churches. For me, the exhibition raised questions of belief – why do people believe that someone thought to save the Virgin Mary’s breast milk all those centuries ago? If all the pieces of the true cross were put together, how big would the cross be? Was it faith that created relics, or economic and political need? That said, the exhibition also made me think about why and how different religions come up with similar practices and ideas. Several of the reliquaries contained the toothes of saints. These relic would have been wrapped and placed in a reliquary casket, to be carried in procession under a panoply. 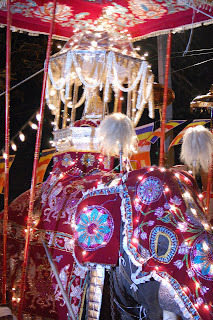 During the Kandy perahera in Sri Lanka, the Temple of the Tooth is represented in the parade of the four Kandy temples, processing around the town every night for a month. On a few nights, the Tooth relic actually carried on the back of an elephant, wrapped in a reliquary box, and paraded under a panoply held up on poles by six men. Other nights the elephant parades with an empty palanquin. The small paintings on tinplate are in a naive style. In some, the space is full with the scene of the accident, the saint and the dedication, in others the rectangular ‘canvas’ is very empty – perhaps a huge room with a chequered floor, a small bed in one corner and the saint hovering in another. The paintings are arranged as art works in a single line around the walls of the gallery – but at the entrance a display of reproductions shows how they would be seen by the faithful, with hundreds nailed up cheek by jowl to cover the walls of the church. One wall in the exhibition holds a collection of contemporary ex-votos from the church of Real de Catorce, an old silver mining community. People rarely commission a painting now, but anyone can pin up a prayer or a photograph, a child’s baby-grow or a wedding dress, all dedicated to St Anthony as thanks for anything from getting a job to falling pregnant or recovering from illness. Anyone can present a milagro or little silver or brass pendant of what they need help with, be it their eyesight, their dog or their car, and at the church of Real de Catorce these are used to create decorate the walls. Visitors to these exhibitions fall into different camps: those who believe in the power of the things on display, those with faith but not in Catholicism, and those who see the objects as art, and wonder why people believe a saint would hear their prayer and help them. Alongside Infinatas Gracias at the Wellcome is another exhibition, Charmed Life: the solace of objects, an artist’s interpretation of a collection of amulets made by the Edwardian folklorist Edward Lovett. The juxtaposition of votive offerings from Mexico with fabric-covered horseshoes to protect against nightmares and coral hands to ward off the evil eye is an interesting one – in both cases the objects seem to be created by belief. Where next for equalities and diversity in the culture and arts sectors? The policy and funding landscape has changed dramatically in recent times and the full implications of this are still not yet clear for the culture and arts sectors. 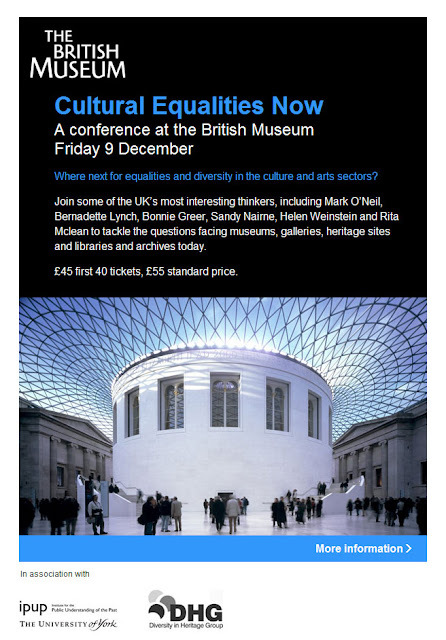 This conference is for practitioners, policy makers and researchers interested in diversity in the cultural sector. The talks will focus on keeping the access and diversity agenda alive as budgets shrink, who funds and supports this work now, the opportunities and threats of the Big Society and Localism, the effect of the new Equalities Act on different organisations, and changing approaches to inclusion in the sector. 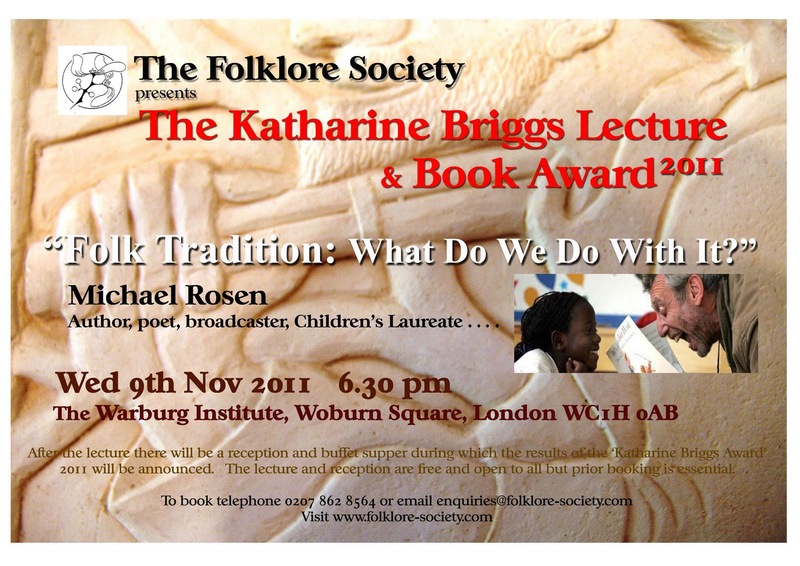 Conference fees have been subsidised by the British Museum to help you attend. The British Museum is seeking a specialist of academic distinction to lead and manage the Department of Africa, Oceania and the Americas. They will be responsible for the curation of the Museum’s comprehensive collection of artefacts and pictorial and archival collections from Africa, Oceania and the America. They will direct the department’s curatorial and academic work, including research and overseas fieldwork and excavations, ensuring the maintenance of a high level of service to the public. They will be responsible for the management of the department’s staff and play a leading role in maintaining and developing links with appropriate peer academic institutions nationally and internationally, and especially with significant groups and bodies in relevant countries. A recognised authority in a relevant field,they will have experience at a senior level in a museum, university or similar institution. They will have the ability to manage and inspire the department, to participate widely in the Museum’s affairs and to undertake a representational role both in the UK and abroad. If you have any queries regarding this role, please email bm@penna.com or call 0845 601 1124. Please quote the job reference number in the subject line of any email and at the beginning of a call. Following a recent funding award from the Leverhulme Trust, Phase Four of the Carmichael Watson Project aims to research the material culture and collecting practices of the Hebridean folklorist and collector Alexander Carmichael (1832–1912), and to catalogue and contextualise the objects, field monuments and sites collected or described by him. We require an experienced post-doctoral researcher with proven ethnographic, object-based, linguistic, and research skills to play a key role in the Carmichael Watson Project team. You will identify, investigate, classify and contextualise objects collected by Alexander Carmichael, disseminate project findings, and assist with overall project delivery and resource development. You will have a PhD in one of the following fields relating to Scottish Gaelic/Irish: folklore, ethnology, literature, history or museum studies. You should be fluent in Gaelic, or fluent in Irish with some knowledge of Scottish Gaelic and willingness to augment that knowledge. Highly developed organisational and problem-solving abilities are a requirement, as are ICT skills, and excellent interpersonal and communication skills. For further details and instructions on how to apply please visit http://www.jobs.ed.ac.uk/ quoting the above vacancy reference number. · Temporary administrative cover to enable time away from work to undertake research.